1938-39 (2884 - 2899, 3800 - 3803) to lot number 321. 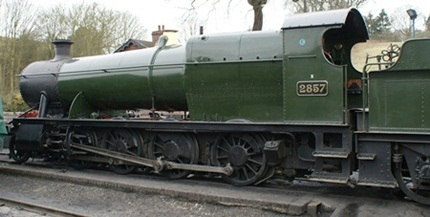 The prototype of the '2800' class, number 97, was the first locomotive to operate in Britain with this wheel arrangement. It was fitted with the Standard number 1 boiler working at 200 p.s.i. and cylinders of 18 inches diameter. In order to allow some flexibility over the 16 feet 10 inch wheelbase, the tyres on the second and third pair of driving wheels used thinner flanges and the front pair of coupling rods were fitted with spherical joints in order to permit a small amount of side play. It was renumbered 2800 in 1906. With additions of windowed cabs, a casing for the fire irons and outside steam pipes fitted as standard, the last batch ( 2884 - 2899 & 3800 - 3866 ) brought the total number of the class to 167. 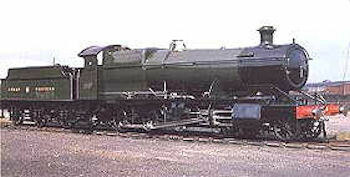 This later batches were known as the '2884' class to highlight the differences from the earlier locomotives. To strengthen the front frame overhang, support struts were fitted between the smokebox saddle and the front end of theframe to all members of the class from 1908. As with most GWR locomotives, superheating was added in 1909, firstly to number 2808 whilst top feed was fitted as standard from number 2836 in 1912 with previous engines being so modified. Meanwhile the front frame was altered to the familiar curved shape in 1911 from number 2831 and again previous members were modified later. The shape of the curved frame was not as great as the type fitted to the 'Saint' class for example, since the size of the driving wheels gave a low height running plate. The last modification to the class was the use of outside steam pipes together with a new pattern of cylinder block introduced in 1934. 16 engines of the class have been preserved and they are numbers 2807, 2818, 2857, 2859, 2861, 2873, 2874, 2885, 3802, 3803, 3814, 3822, 3845, 3850, 3855 and 3862.